This is, I suppose, nothing more than a public service message plus a little bit of self-service. I generally get annoyed by "audiophiles" because they tend to spend their time looking for things to dislike in recordings, but, I have to agree with many of them who claim that an mp3 does not sound as good as a CD. I think it is completely true. 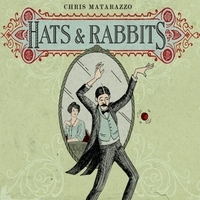 I'll occasionally listen to my 2011 album, Hats and Rabbits, on my phone, in the car. The other day, for some reason, I put in the CD and, as attuned as I am to every aspect of the sound (having recorded, engineered and produced it all myself) I was completely taken by surprise by the added depth of the sound on CD. I'm not sure if everyone would notice this difference, consciously, but I do believe that music works on so many levels that it could have an overall effect on the listener. It's similar to the effect of drinking a Coke, with high fructose corn syrup, and then drinking a Mexican Coke with real sugar: something is just more right about it, even if you can't consciously put your finger on it. That said, I am not afraid to self-promote, having listened, recently, to my work, and thinking I done pretty good, and to give you a link to buy the actual CD. Also, in a few months, my collection of piano pieces, American Sketches, will be ready, and available on both CD and download -- I suggest the CD. Self-promotion aside, it really does make a difference. A step back to CDs could feed your soul on unconscious levels. There's a richness there that mp3s just lose. I guess this position is similar to that of the "vinyl" people (the smart ones, not the dumb ones who say they miss the scratchy sounds, but the ones who prefer the warmth of analog sound). Too much virtuality. Not enough to sink our teeth into. The world of the senses is slipping away every day, stolen by the scramble for efficiency and ubiquitousness. Everythnig is low fat, across the senses' board.